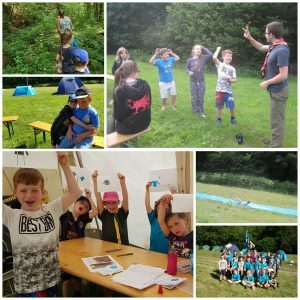 Beavers from 1st Clive's Own Welshpool and 1st Llanrhaeadr Ym Mochnant held a joint "Damboree" Camp at our Area Campsite last Weekend (22nd-24th June). 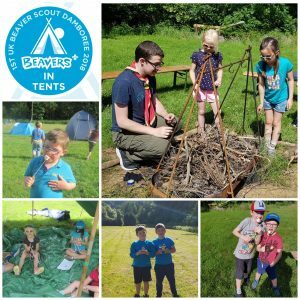 24 Beavers between 5 and 8 yrs old (and 1 cub) from both groups slept in tents for up to two nights and 26 took part in many activities over the weekend. They looked at what Beavers wore in 1986, Beavers in the wild, made the word "Damboree" using natural materials found around the site, tried some knots and pioneering, lit candles, tried out hammocks, learnt campfire songs, built a campfire, toasted marshmallows, got wet on a water slide and tried Archery. 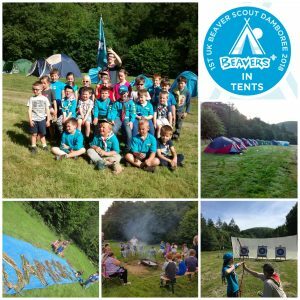 For the 20 of the Beavers this was their first nights away experience in Beavers! The Beavers and leaders all made new friends and had a lot of fun.